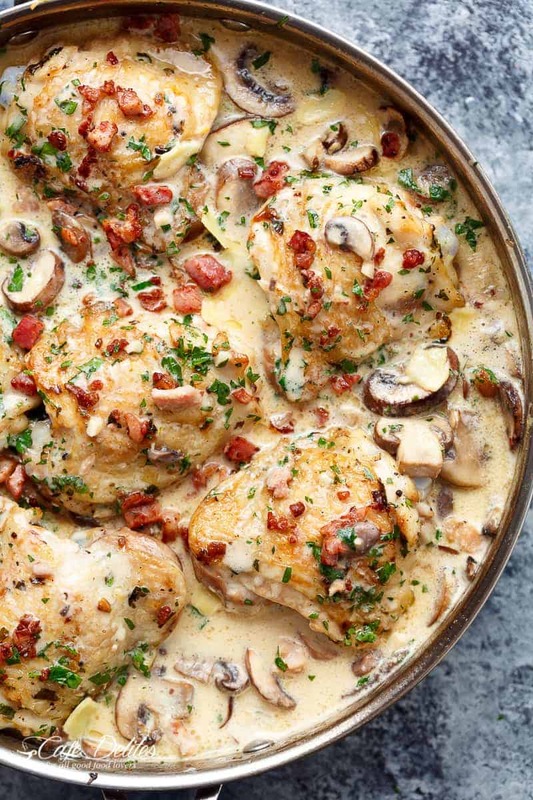 Creamy Garlic Parmesan Mushroom Chicken & Bacon is packed full of flavour for an easy, weeknight dinner the whole family will love! Pulling out an old reader favourite! 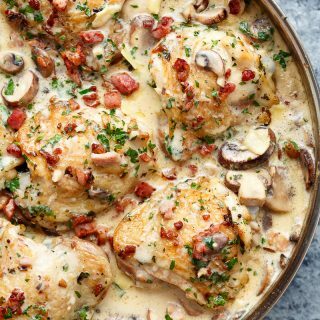 Creamy Garlic Parmesan Mushroom Chicken & Bacon is a perfect meal for all of your family and friends to enjoy! Where do I start with THIS pan? The crispy skinned, juicy chicken thighs? Or the crispy bacon? Maybe the garlic / parmesan cream sauce loaded with sliced mushrooms. There’s nothing like a delicious bowl of Creamy Chicken Mushroom! But throw in crispy skinned chicken WITH crispy bacon and you’re onto a winner. Both heavy cream and lightened up cream options have been included in this recipe. Heavy cream for those of us on low carb, high fat dietary preferences. May the fats be forever in your favor. Lightened up with half and half (or reduced fat cream) for the other percentage of us worried about squeezing jeans passed our non-forgiving thighs. 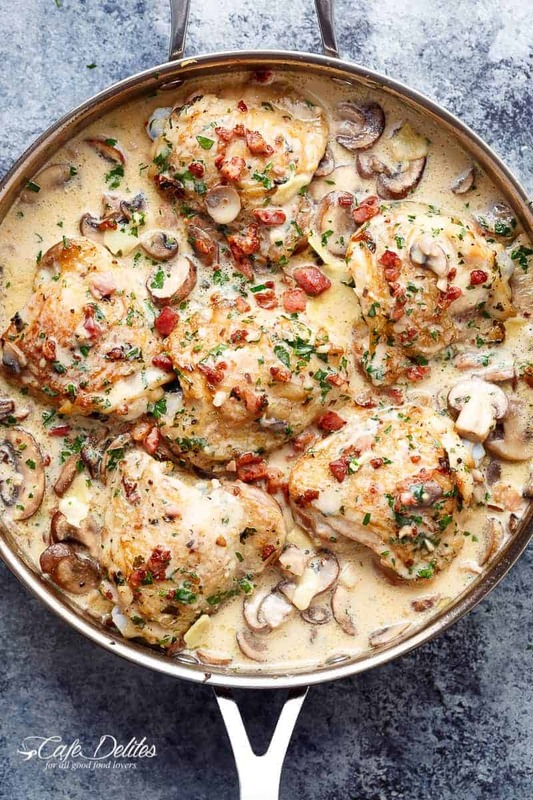 Creamy sauces are a favourite over here and I usually cheat on cream with lightened up versions like in this creamy piccata OR this sun dried tomato chicken. HowEVER, I sometimes like to use full fat cream, because HELLO nothing beats the full fat flavour of cream. Dinner in my house has been looking a lot like this lately — mighty fine if you ask me. 30-40 minute dinners where my oven is fast becoming my bestest friend. This one takes the cake. Or the cream. Whatever. These flavours are seen in most of our family recipes. Garlic Parmesan Mashed Potatoes, Garlic Parmesan Salmon, Garlic Parmesan Mac And Cheese, Garlic Parmesan Sweet Potatoes, etc. When sharing this Mac and Cheese video on Facebook, my husband was all over me telling me to try the same flavours in a creamy sauce with CHICKEN AND THROW IN SOME BACON FOR GOOD MEASURE. 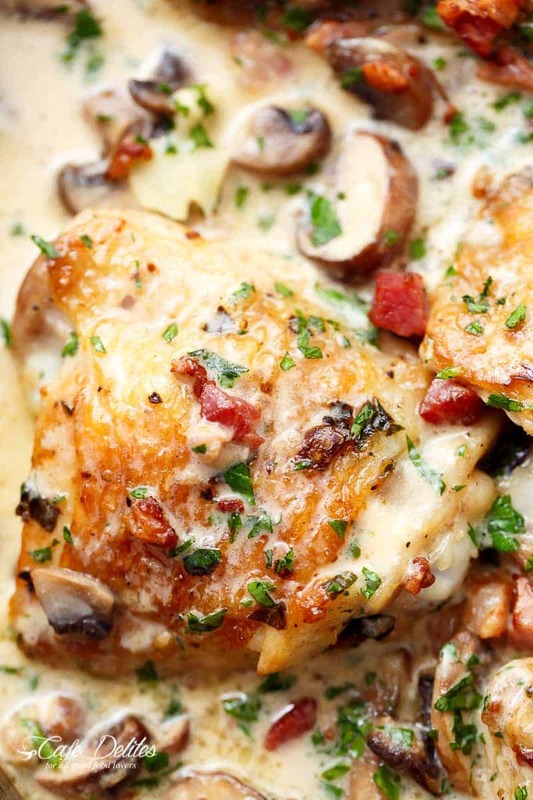 WATCH HOW WE MAKE THIS Creamy Garlic Parmesan Mushroom Chicken & Bacon HERE! Preheat oven to 200°C | 400°F. Arrange chicken on a plate. Combine together the olive oil, garlic, parsley, salt and pepper in a jug. Rub the oil mixture over the chicken to completely coat. Heat a large oven proof pan or skillet over medium high heat. Sear the chicken, skin-side down first, until skin is crisp and golden brown. Rotate and sear the other side (about 2-3 minutes per side). Transfer to oven and roast until completely cooked through, about 25-30 minutes. Once chicken is done, remove from skillet; set aside. Pour out HALF of the chicken juices left in the pan. Using the same skillet the chicken was in, fry the garlic in the reserved chicken juices over medium heat, stirring frequently until fragrant, about 1 minute. Add the bacon and fry until just beginning to crisp. Add in the mushrooms and cook until mushrooms begin to soften. Season with pepper. Taste first before adding in any extra salt, as the bacon will add the salt. Add the chicken back into the pan; allow to simmer for 1-2 minutes in the cream to take on the flavours. Garnish with parsley and shaved or grated parmesan, if desired. Serve over rice, pasta, or steamed/grilled vegetables. If using cream: Thickened cream, heavy cream, light or reduced fat cooking cream are all fine to use. If you prefer a thicker sauce, whisk together 1 level teaspoon cornstarch with 1 tablespoon cream until lump free and well blended. Add the mixture into the cream sauce, while stirring continuously, until thickened. If using half and half: Bring to a gentle simmer; whisk 2 teaspoons of cornstarch into 1-2 tablespoons of *extra* half and half; pour cornstarch mixture into the centre of the pan; stir continuously until the sauce thickens and becomes a 'cream'. Nutrition facts are calculated based on skin-on, bone in thighs, and reduced fat cream. I just made this dish tonight recently started doing Keto and have been trying recipes. This is delicious I put my own spin on it adding sun dried tomatoes and green onions. I highly recommend this recipe. This dish was delicious…restaurant quality. I made this for dinner tonight. It was awesome!!!! Really delicious. I served it on top of rice. Next time I will serve it over bow tie pasta. Thank you for sharing. That’s wonderful Christine! Go YOU! Amazing!! I made this last night for the family. Big hit however mine wasn’t as picture perfect as the one posted here. I used Turkey Bacon and had to use a little cornstarch to thicken the sauce. Be careful with that step, my sauce thickened instantly lol. Thank you so much for posting this recipe. This is delicious! I made it for company and everyone wanted the recipe. You write the recipe so it is easy to follow. Thank you! Looks so delicious!! Are white mushrooms okay with this? Got the wrong ones at the store. Yes, that will still work great! Oh my goodness , I mean I have always loved cooking I have always experiment with things but this was absolutely fantastic! I give you5 stars and a bunch of high 5s. I could eat that whole pan, well I wish, my house just got seriously stingy! Lol thank you, Elizabeth D.
My sister and I made this together.We used cut up boneless skinless chicken thighs and we got rid of the searing step.Best dish we have ever made! It’s gluten free!! I’m in love! Can’t wait to make this recipe, it just seems like the perfect dinner combo! Is it ok if i will not bake the chicken ???? Wow! I made this on stovetop because it was too hot to turn on the oven. I cut up boneless, skinless chicken thighs and browned in bacon grease and added chopped onions. I used milk with cornstarch to thicken, stirred in Parmesan at the end, and served it over rice cooked in chicken broth. Absolutely delicious!!! I have made this a couple times. I am never able to fully leave a recipe alone, no matter how delicious it is. Here are some of the additions I add. 1/2 cup or so of diced onion when I sear the chicken. 1/2 cup of White Wine to deglaze the pan before adding the cream and broth. 1 Cup of Spinach leaves and let them wilt into the sauce before I add the chicken back to the pan. I recently served it with chicken tortellini and our guests loved it. That sounds great! I am glad that you were able to make it your own. Thank you for sharing and following along with me! Wow!! Great recipe Karina. I made it for my husband and a friend and they both loved it. Seriously Delicious. I will be making this again and again. AWE! Thank you so much hun! That means a lot to me! Thanks so much for following along with me. I am so glad that you enjoyed this chicken. Hi, this looks delicious. I could not find chicken broth, can I use chicken stock instead? Yes, of course! Enjoy your chicken! YAY!! That is great to hear! I am so glad you found this recipe and that you loved it! Thank you for following along with me! This was absolutely delicious—even the husband who doesn’t much care for chicken thought so. That is so great! When the husband is satisfied it makes all the difference! Super yummy! I changed a few things that I thought were great.After I browned the bacon I removed it from the pan and drained on paper towels & then wiped out the pan, so I didn’t have all that bacon grease. I added the mushrooms to the pan with a little butter to let brown. Then I added the bacon back and garlic so it didn’t burn and then I added 2 tablespoons flour and then milk and chicken stock and would add more milk or stock to my desired consistency. I added a few tablespoons of sun-dried tomatoes to the bacon which added a nice tangy flavor. Looking at this recipe to make for 60 homeless men this January. Can you suggest ways to make ahead? This dish was awesome as a base !! Problem is I’m set in my ways so I seasoned my chicken with some adobo instead of salt as well as with some Italian seasonings. I also love sundried tomatoes and thought it would be a good pairing with the bacon and cream. I took this to a company potluck, and there was none left. I will definitely use this recipe again! How can I shorten this for just 2 people for tonights dinner? Hi Chelsy. At the top of the recipe box, you’ll see a number of serves. If you change that number to 2, you will get the quantities needed ? Yummy. This is a keeper. Especially the bacon was a hit. I used skinless boneless chicken. This was easy and delicious. I always have bacon grease in the refrigerator and cooked bacon leftover from Sundays, so I had shortcut using the bacon grease and reheating bacon to use at the end. I made extra sauce to use over rice, but it would have been wonderful to use over pasta. Husband liked it and it’s a keeper. THANK YOU~! Just made this recipe for dinner tonight. I added white wine and OMG it’s beyond delicious! Will definitely make it again! Thank you! In the picture for this recipe it shows what looks like red pepper or is it sun dried tomatoes? There is not either one in the recipe. I would like to try making this but was wondering which was in it. Hi Rosalyn! I believe it’s the bacon pieces? So worth the second degree burn to my hand and trip to urgent care I got while making this amazing dish! Oh my gosh Layna! How did you do that? Are you okay? This looks absolutely devine!! I have one question. Can I use jarred mushrooms? I love mushrooms but have never prepared them. Hi. Just wondering if I could use packaged real bacon bits instead. Of frying bacon? Oh my Heaven’s this is amazing!!! This looks delicious and I can’t wait to make it. What temperature did you set your oven to? This was great! I wanted it a little less sanity for my toddlers so I used some of the water from the fettuccini I cooked. Definitely moving this pin to my “favorite meals” folder. I made this recipe over the weekend and it was so delicious!! I made it with broccoli and white rice. I did leave out the mushrooms since my boyfriend doesn’t like them, but I loved the bacon in the sauce. I will definitely be making this again and again. Thank you for sharing! Will try I just fond this recipe it look great ! I made this recipe and it was the most delicious chicken dinner I have ever had. That is not an exaggeration. I have made Julia Child’s recipes with wine and cream which was delicious, and I will honestly say that the sauce in this recipe was better than Julia Child’s white sauce. I think the bacon had a tremendous push to it, and the mushrooms and chicken broth topped it off. As far as my taste goes, this was how much I loved this recipe. The next day after I cooked this chicken dinner, I went back to the store and got ingredients to make some more of the sauce and I froze the sauce in increments for other dinners. I didn’t change anything to this recipe but instead of using milk or cream I used half-and-half. I made this for dinner tonight and it was great! I used chicken breasts and cooked bacon. Thanks for the recipe. This looks delicious! Do you think I could substitute boneless skinless chicken breast? Can’t wait to try the recipe for dinner! Delicious. Family loved. Used boneless thighs which we like better. Will b making again and again. Tks so much? This looks delicious! I plan on making it for the family tonight! One question- I am going to use boneless chicken breast instead, how would that affect the cook time? Can you use boneless chicken breasts with this? Thanks! I made this and absolutely loved it! I gave some to friends to try and they raved about it too. I used Half n’ Half and thickened the sauce as per the instructions. I also fried the bacon and drained it to reduce the fat content but it didn’t adversely affect the recipe at all. I’ll definitely make this often. This recipe was a huge hit with my family! So good and something I will be making again. I didn’t change a thing! Delicious….if you want to cut the calories but not give up the creaminess, do what I do. I use Carnation low fat condensed canned milk. All the creaminess of regular cream without the added fat. What type of bacon did you use? This was delicious! The only thing I substituted was the bacon (I didn’t have any). I used baked ham instead. I also followed the milk directions instead of cream. It was perfect! I served it with mashed potatoes and roasted carrots. A definite keeper! Thanks so much! This was fabulous!!!!! So yummy and everyone loved it!!! This is so amazing! I didn’t change a thing (except I doubled it for a big family). The flavors are wonderful and everybody loves it…which is absolutely impossible if you knew my family. Finally a meal that everyone will eat. Thank you so much for your recipes! I’ve made 3 of them already and all of them are delicious and will be in the Johnson household for a long time. Karina: is it possible to get the nutritional info for your recipes? Is there a fish substitute in all your fish recipe, like milk fish, cream Dori? Because salmon in the Phils. is very expensive ! Hope to hear from you soon and thank u for your time and effort in attending to my question . Hi Teresita! You can definitely use other fish to replace the salmon. It shouldn’t be an issue in regards to taste! If you try some, please let me know how you go! When do you add the chicken back into the sauce? Do you need to let the Chicken recook a couple of minutes in the sauce?